Spring is an ideal season for the ankle boots, which are the favorites among the contemporary women. The last couple seasons the major fashion designers keep demonstrating us that the socks can actually work great with elegant shoes, despite the generally accepted notion that this is a big style mistake. We are going to present you the stylish ways of wearing your colored socks with classy footwear for the bold and original looks. The thing socks best work with the stiletto shoes, t-straps and ankle-straps. Opt for the socks of the ankle length and knee high with the plain or ribbed structure, they will best complement the high heel shoes. The thick knitted socks are intended for wearing with the ankle boots and other type of shoes with thick heels. By the way, loafers work great with thick socks too. Simply opt for the plain or cabled socks in the matching or contrasting color. Going to attend the black tie party, consider wearing the beautiful socks made from lace, sheer or even embroidered ones under your elegant shoes. 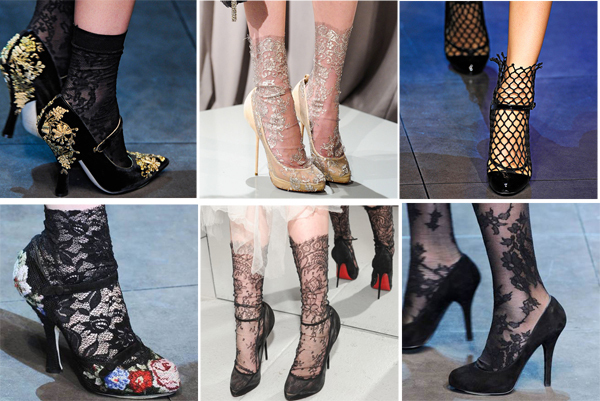 There is a great variety of stunning socks like paneled, pointelle and lace trimmed ones. The hottest trend of the last couple seasons- open toe ankle boots- is a perfect footwear for the spring period. If you don’t dare to wear them with bare feet, consider complementing your boots with thin socks in the neutral gamma, what will allow adding an elegant touch to your overall look. In case you want to create an edgy vibe with your socks, simply opt for the ones with an interesting texture and patterns.